This frontier town, formerly known as the "Salmon Capital of the World," is a gateway to outdoor adventures and is known as Alaska's First City because it was the first major community that travellers came to when heading north. 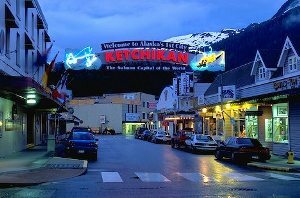 Founded as a fishing camp, Ketchikan is built on steep hillsides at the base of Deer Mountain and is a quaint village just three miles long and three blocks wide. We recommend a visit to Totem Bight State Historical Park, With the world's largest collection of totem poles, these wood-carved creations represent colourful, intricate tales, often showing a family's history or depicting a local legend. Also a visit to Creek Street Boardwalk with its historic cable car and quaint boutiques is a great place to spend a relaxing afternoon. If you are looking to do one expensive excursion on your Alaska Cruise and want to go airborne. This is the place to do it. They offer a fantastic float place experience which goes to Misty Fjord. If you are looking for something to do which is also a lot of fun is the Alaska lumberjack show. This is a good hour of fun family entertainment and relatively inexpensive.